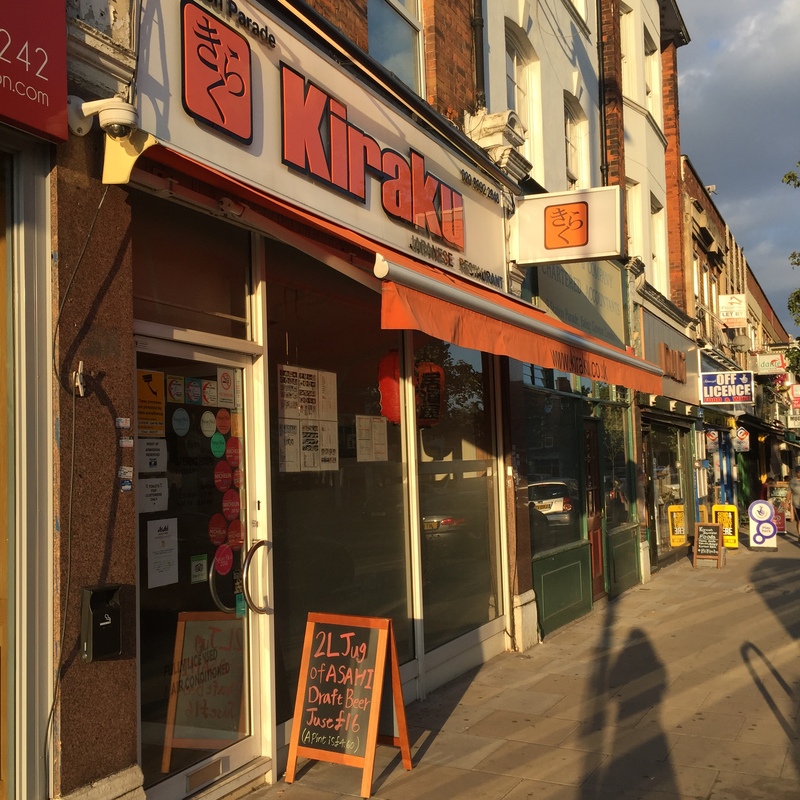 Kiraku, Ealing: a review and a love story. We fell in love when I was sixteen. 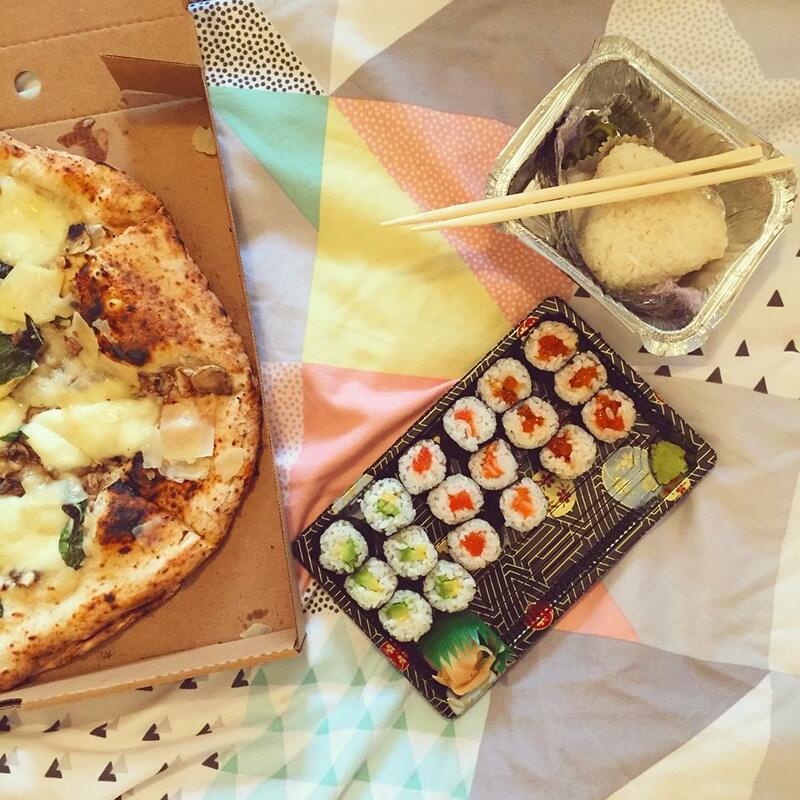 I say we because, although many people would argue that sushi doesn’t really have feelings -it being food and all that- I like to believe that the feeling was mutual. Before then I was a little scared and sceptical. First of all, raw fish. That just didn’t sound appealing. My mum would also love to tell me horror story whenever she read from a dubious source that this and that person had died from eating raw fish. Even though this came from my mother, a woman who had eaten her way through many barely cooked steak hachés and tartares and admitted to often eating raw sausage when she was young, those cautionary tales just put me off the whole thing. My more adventurous friends would often try to convince me to go out and try it. ‘I don’t like it‘ – I would lie – ‘I don’t like the texture‘, I would add without ever having encountered the mysterious rolls. And then I caved in. I still remember the place, I even remember the dish: tempura prawn uramaki. It was love at first bite. Those little pockets of savouriness, the crispiness of the tempura batter and the sesame, the mellow simplicity of the white sticky rice, the intense savouriness of thick, black soy sauce. Suddenly, I was on a mission to eat it all. 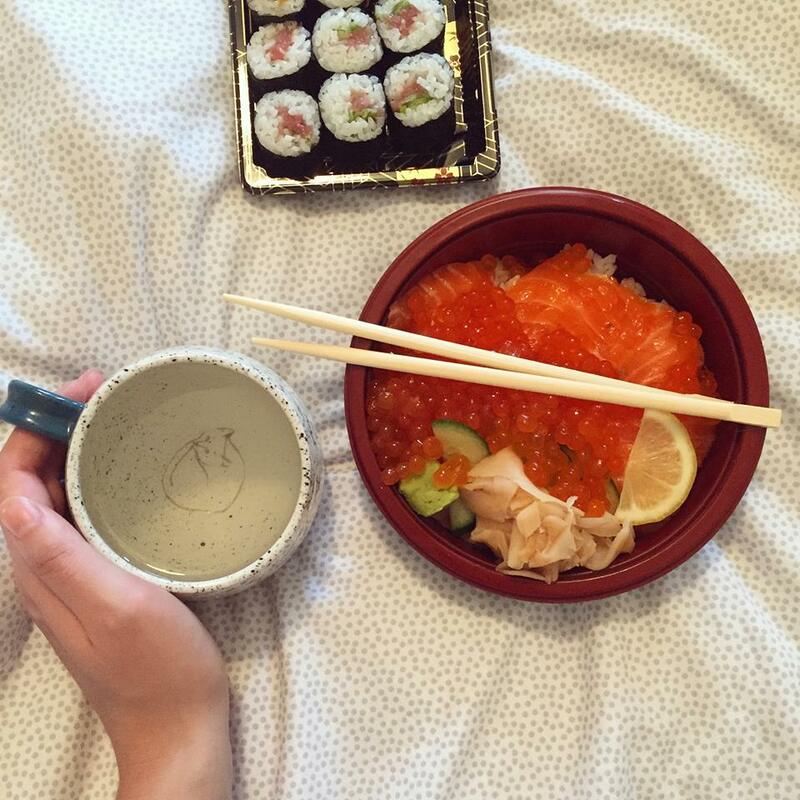 We’ve been together ten years, sushi and I. We’ve been through a lot. Or maybe I have been through a lot (of sushi). But you know what I mean. I’ve seen it all. Bad supermarket sushi, dry and bitter, filled with unlikely ingredients they clearly had a surplus of (red pepper?). I’ve been through the bland and chewy, though the nausea-inducing over-filled rolls containing tubs of mayo, through the unnecessarily expensive sushi with foie grois and caviar and gold leaves and the likes that lands you a diet of instant ramen and mash for the following weeks.. The concept of having a local sushi restaurant, though, still escaped me. 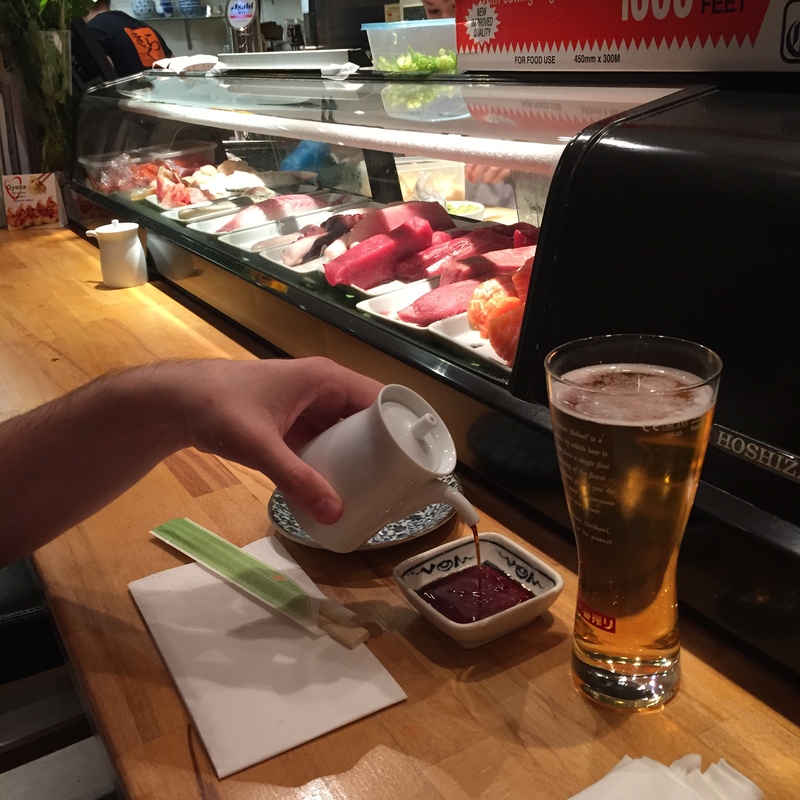 I had never been to a sushi place you wouldn’t have to dress up for, somewhere where you could lazily leaf through a paper menu, have a cup of green tea on the house, and hurry home, giddy with excitement, a paper bag in your hand. Then I moved to Ealing and stumbled upon Kiraku. Kiraku is a tiny, unassuming place – from the outside, it looks like any other takeaway, its door covered in menus and special offers, wind chimes tinkling every time the door opens, smiley waitresses bringing you a mug of green tea, an incredibly skilled sushi chef who cuts fish and rolls it in rice which such mesmerising fluidity that I can’t help but watch every move. Kiraku makes great sushi. Simple, great sushi. 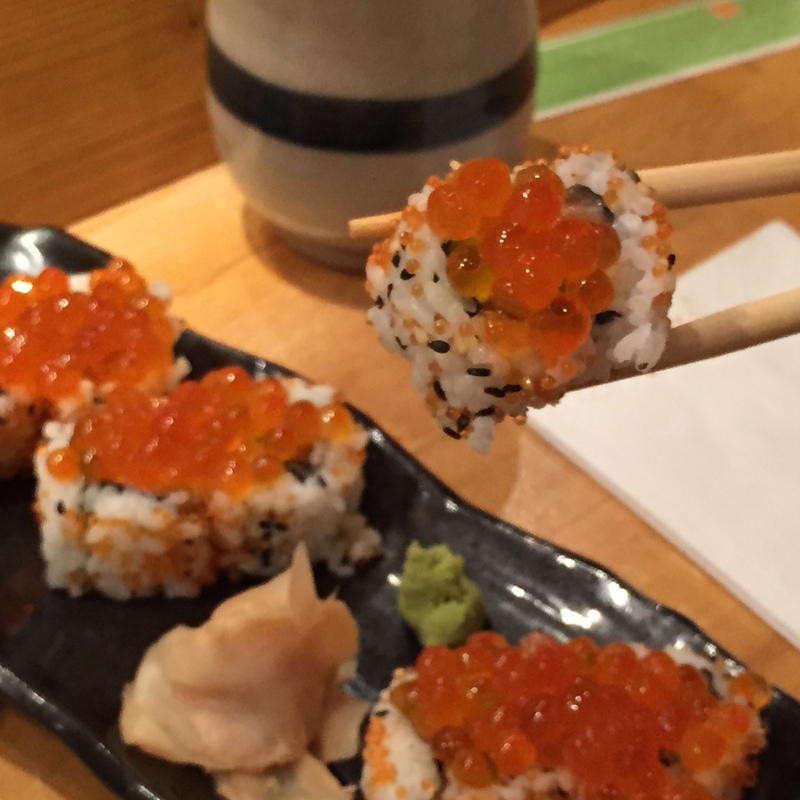 Their fatty tuna makis are made with buttery tuna and bright chives. The donburi is probably my favourite: a bowl of perfectly cooked sticky rice with generous slices of jewel-hued, marbled salmon and ikura, little dots of intense saltiness. Pickles and wasabi are there to break the pattern, lift the softness, give it all balance. Oh, and crispy salmon skin maki, did I mention? Crispy salmon skin maki. You can also eat in and it’s equally lovely, with its small wooden tables, a laid-back atmosphere, and free mugs of green tea to warm your hands on. 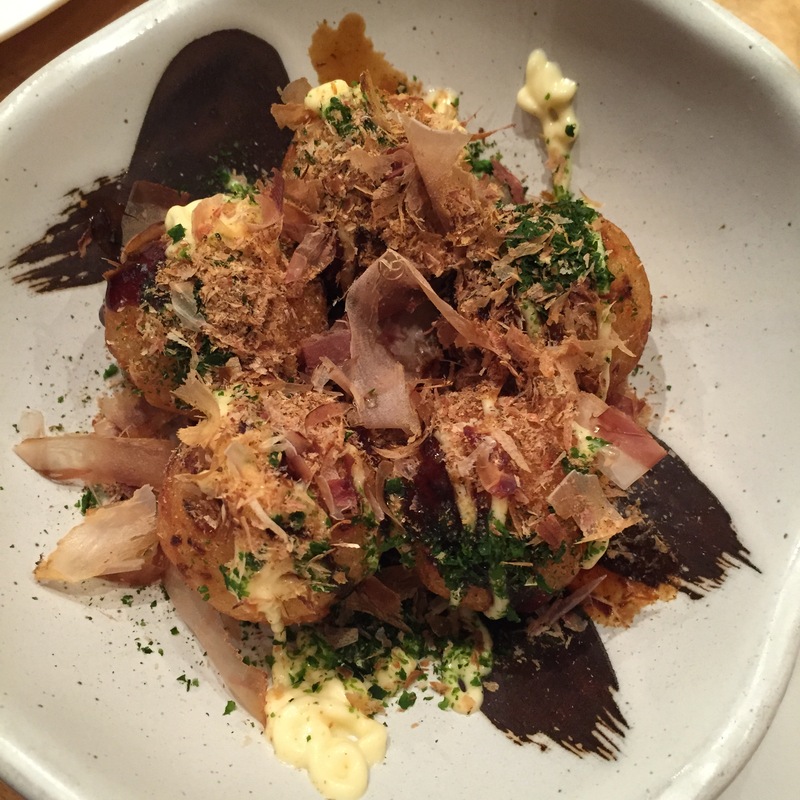 The takoyakis are unmissable: crispy balls of octopus-based batter with the softest, almost creamy centre. You can even wash it down with a huge 4-liter jug of beer. So yeah, ten years, and going strong. Previous Post Bao, Soho. A review and a queue.